Dog Legislation Education by Pit Girl: The time is now for Missouri!!!!!!! The time is now for Missouri!!!!!!! First and foremost, is House Bill 1811 that passed the Missouri House last week by a vote of 117-7! This bill could potentially not allow cities to ban specific breeds of dogs, causing municipalities to focus on a dog's behavior instead of their looks. It has been proven over and over again that Breed Specific Legislation is expensive and time consuming to enforce. The United States is trending toward legislation that helps Animal Control officers base their decisions on the dog and the owners behavior instead of the breed/look of the dog. 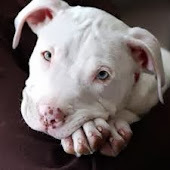 There are currently 20 of our 50 states that have enacted laws that prohibit cities from passing breed-specific laws, according to Bless The Bullys. This new bill, if it is passed in the Senate, it will let law enforcement focus on the offenders instead of the responsible owners and dogs with no behavioral issues. The Missouri Senate has until May 13th to act on this bill! Please write your local senator and tell them how you feel about Breed Specific Legislation... as a citizen of their district (with voting rights)! Contact your state senators here! Secondly, what I wanted to talk about is an experience I had this weekend in Independence, Mo. I was driving a hurt puppy up to the local shelter. This particular transport was important because we needed to get him to a rescue that could afford to help him feel better, and maybe help him walk right again someday. I almost always travel with my 10 year American Pit Bull Terrier. ***She has her Canine Good Citizen, is a demo dog for many of my classes, has shown in agility in the past, and has no bite record*** Keep in mind that Independence is about 3 hours from where I live here in Springfield. I was about 2 hours into the drive when I asked my co-pilot to check the internet and see if the city of Independence had any breed restrictions. I always travel with all of the essential "Breed Restriction" paraphernalia being as I usually have her with me. For those of you don't know what items you might need, I carry a muzzle, gentle leader, crate, shot records, rabies tag, and my tag showing she is registered with my local Animal Control. Living in a city that has "Breed Restrictions" on Pit Bulls it should have been old hat to go to another city that had ordinances. When he read to me a quote off of Google my heart dropped to my toes and I almost had to pull over. "The municipal code of Independence, Missouri makes it unlawful to own, possess, transport, or sell any pit bull...". Have you ever had that instant feeling of helplessness for an animal that is being punished or is hurt and did nothing wrong? "They could take my baby away from me! Then I thought...#$%# I'm going to end up in jail if someone tries to take my baby! Then my mind went to...If they took her, she is old and has SEVERE anxiety! She could have a heart attack! Next thought was...I'm calling transport! I am not crossing that city's line!" So, here I was, doing a good deed...meeting up with people doing a good deed...and because of one ordinance that costs taxpayers extra money, takes time away from offenders, and has been proven to be ineffective... I was having a panic attack and the puppy may not have been able to make it to the transport. The puppy made it to transport, (I'm not going to elaborate on how), I was exhausted for a day after my panic attack, and I learned what other people must feel like when City Officials try to take their family members. That was one of the most disgusting feelings in my life. I can't imagine living that feeling any longer than I did. This experience has made me so much more determined to get all Breed Specific Legislation repealed. This is a crazy piece of legislation that is usually made in a panic by people who have no clue about dogs...sometimes they're even "cat people".